I received a lovely surprise gift from my parents today. 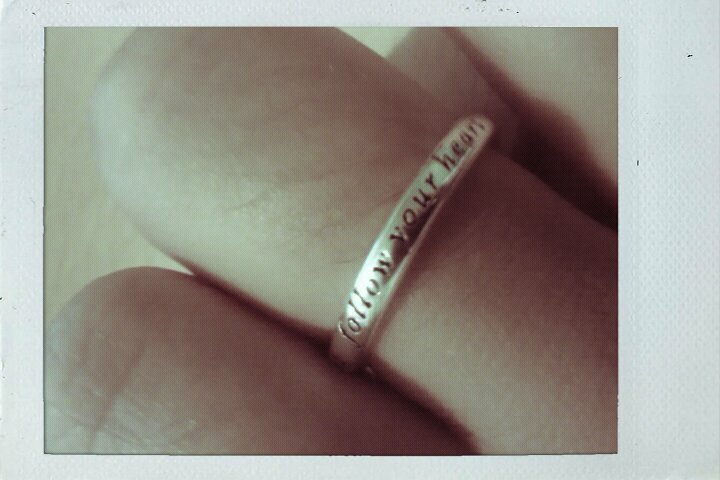 A silver-ring into which are inscribed the words, ‘follow your heart’. I’m sure my parents wish that somebody else was buying me a ring…you know, somebody nearer my age with an xy chromosome who wants to spend the rest of their life with me, but that doesn’t matter, because those three words around my finger have never seemed as important to me as they do right now. I believe that if we follow our hearts, we will eventually always end up exactly where we want to be..or at least, somewhere in the vicinity. The journey may be harder. We may trip on plenty of stones along the way. There’ll probably be tears. There’ll be times when we look across the central reservation of the motorway in envy of the nice, shiny cars zipping along in the opposite direction whilst we sit in the lay-by, sipping coffee from a thermos flask and waiting for the AA to arrive and fix our punctured tire. But whilst we wait, at least we can look at the road ahead and know that despite the potholes, every metre we transcend is a metre closer to our dreams. If we were to follow our heads, no doubt there would be a helpful bypass or two en-route, ones that could make our journey that little bit easier and faster, but once we were to reach our destination, would we even feel pleased to have arrived there or would it just be considered a means to an end? One of the biggest dilemmas in life is knowing whether to choose between your head and heart. When the two are in conflict, it can be very difficult to make any decision at all. But for now I’m going with my heart, simply because it knows what makes me smile, and even if it takes me down shady back-alleys and across bridges constructed of frayed rope and damp wood, at least every single step will have a purpose, a step closer to the dream. It is down to us to firstly believe in the things we want to achieve, and then take the steps to get them, even if it means taking the riskier of the two routes. No worthwhile lessons were made from the things we already knew. Fresh, anthemic indie-pop talent from Manhattan.